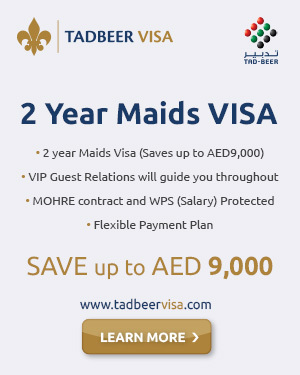 TADBEER Service Centers, authorized by the MoHRE (Ministry of Human Resources and Emiratization)… are the official the handling centers for all domestic workers . Renewing your maids visa is easy. You can bring her to our Tadbeer -Housekeeping Co Center and we can facilitate your renewal immediately. Hassle-free , No responsibility for private sponsorship with no annual renewal fees. Company will provide you the candidate on better terms and conditions, by offering you Employer protection, and taking great care of the employee with WPS ( Salary Protection Scheme), end of service, medical Insurance, Return flights, and arranging any passport renewals, and required exit permits. We offer same day VISA, salary paid via WPS (wages protection system) , medical insurance, end of service, Return flights, 2 year contract. Bring in your worker today for renewal of Maids visa. In September 2017, H. H. Sheikh Khalifa bin Zayed Al Nahyan, the President of the UAE approved Federal Law No. 10 of 2017 on support service workers. The law, also known as Domestic Labour Law offers protection to workers. Prior to this law, the matters of domestic workers were under the purview of Ministry of Interior. However, now they are under the purview of Ministry of Human Resources and Emiratisation. The 41 article-law establishes the principle of informed consent, ensuring that workers are aware of the terms of the contract, nature of work, the workplace, the remuneration and the period of daily and weekly rest as set out by the executive regulations and before they cross their national borders. Either employer or domestic worker may terminate the contract if the other party fails to meet his obligations. The employer or worker may terminate the contract even if the other party has met his obligations. This is called a ‘no-fault’ termination and it is subject to compensation as outlined in the Domestic Labour Law. possession of their personal identification papers such as passports, IDs, etc. either the employer or the worker can refer a dispute to Ministry of Human Resources and Emiratisation. The ministry will attempt to resolve the dispute amicably within a period of two weeks. If it is not resolution within two weeks, then the matter will be referred to a court. cases filed by workers are exempt from court fees at all stages of litigation and must be heard in a speedy and prompt manner. assignment of tasks that are not covered under the contract. Only UAE-registered natural or legal persons with good standing may recruit domestic workers into the UAE. An agency may not, on its own or through a third party, solicit or accept from any worker, whether prior to or after employment, any form of commission in exchange for employment. In the event of early termination, the agency must repatriate the worker at its expense and either offer the employer an acceptable substitute worker or return to the employer the fee they had paid. The agency must at all times treat the worker decently and refrain from exposing him/her to any form of violence. Centres called Tadbeer (linked to WAM news agency), whose services will be regulated by the ministry, will replace domestic worker recruitment agencies by the end of 2017. These centres will guarantee proper visa, orientation and training for the workers.